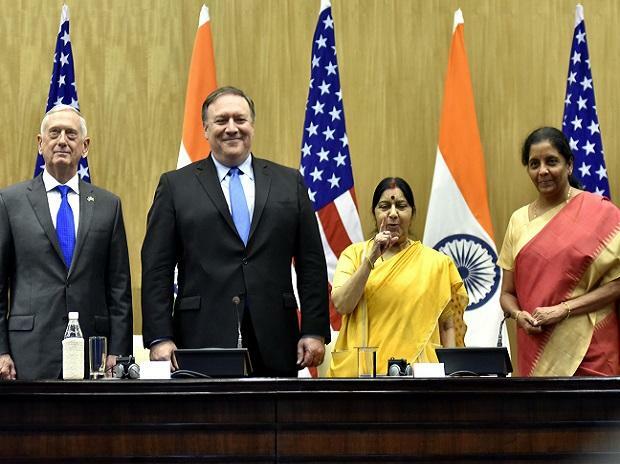 A long-negotiated defence pact under which critical and encrypted defence technologies will be provided to the Indian military by the US was inked here Thursday after the two countries held their first 2+2 dialogue during which they also discussed key issues, including cross-border terrorism, india's NSG bid and the contentious H1B visa issue. "I sought Secretary Pompeo's support to nurture our people-to-people links. Specifically, I conveyed our expectation for a non-discriminatory and predictable approach to the H1B visa regime, given its high impact on innovation, competitiveness and people-to-people partnership, all of which are a vital source of strength for our relationship," Swaraj said.